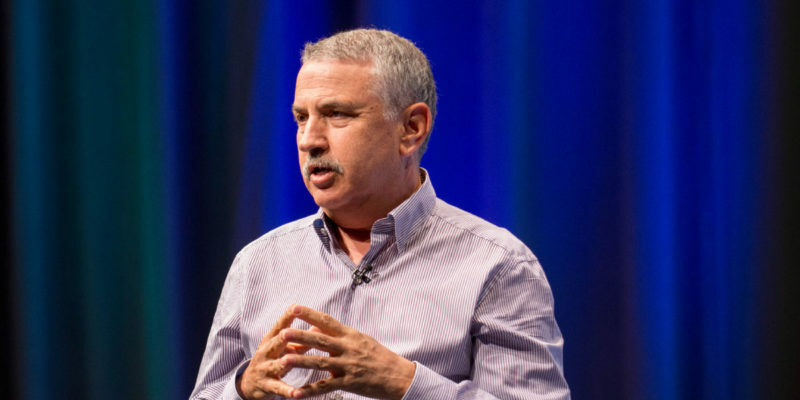 As the opening general session presenter and follow-on community colleges luncheon guest speaker, Thomas Friedman stirred the curiosity and the anxiety of attendees with his provocative view of a world being simultaneously transformed by technology, globalization, and climate change. The New York Times foreign affairs columnist and author of Thank You for Being Late: An Optimist’s Guide to Thriving in the Age of Accelerations (Farrar, Straus, and Giroux, 2016), drew from his research and personal anecdotes to help explain the complexity of our modern age. While it’s easy to identify the big shaping forces once they emerge and surround us, it’s much harder to pinpoint the many nuances that contribute to these forces as they are forming so that we are better prepared to address their impacts, suggested Friedman. He pointed to a torrent of innovative developments in and around the year 2007 that most of us missed—in part because we instead remember that year as the start of the global financial meltdown leading to the worst recession in the United States since the Great Depression. Yet, it was during this time frame—after the internet had crossed the one-billion-users threshold—that Steve Jobs introduced the world to the iPhone and Jeff Bezos showcased the Kindle e-reader; Facebook launched as a communication platform for anyone with a registered e-mail address; Twitter went global; Google purchased and put its weight behind the video-streaming service YouTube; cloud computing was born; IBM was in the final stages of preparing AI (artificial intelligence) computer Watson for its eventual prime-time debut on Jeopardy; and three former schoolmates conceptualized what they would soon launch as Airbnb in response to a sold-out hotel market. How did we miss all that (and much more), asked Friedman? And in what ways have those developments and all that has followed in a steady stream of tech-enabled innovation continued to dramatically shape our daily lives and workplace operations? The problem with following a trend is that it doesn’t happen in isolation, noted Friedman. Even during “normal” times, such a rapid pace of technological change would be greater than the rate at which the average human feels equipped to adapt, he argued. Yet, at this same time of massive technological innovation, which has continued unabated, the social fabric of many already economically fragile communities in the United States began to tear apart with the mass foreclosure of homes, loss of jobs, and the resulting loss of individual pride and dignity. Turn AI (artificial intelligence) into IA (intelligent assistance). Technology is set to transform most jobs with smart controls, allowing individuals to operate at a higher level. Higher education leaders must consider how they can help individuals advance with technology so that they don’t get left behind because of it. Get faster with curriculum development and degree completion. Partnering with businesses to create modular courses for quickly evolving skill-set requirements is one example. Another is converting four-year degree programs into three-year programs to immediately cut an individual’s education costs by 25 percent, which means more individuals are likely to finish on time, noted Friedman. Provide lifelong learning to fill recurring gaps in skills and education, and prepare students to adopt a lifelong learning mindset. The digital divide will largely be erased within a decade, argued Friedman. In its wake: a motivational divide. Self-motivation will increasingly be required to take advantage of lifelong learning opportunities, he said. Don’t phase out soft skills. 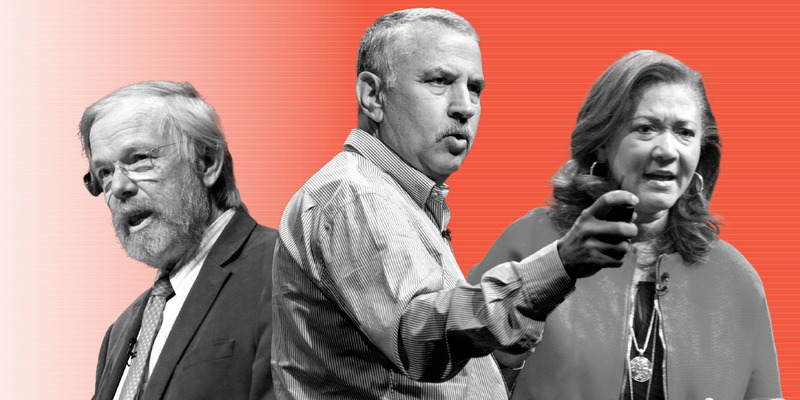 Bottom line, education is never one thing, said Friedman. Learning how to interact politely, communicate clearly, and engage effectively with others are not skills that you can download. Consider what faculty do that is still most effectively done face-to-face. Likewise, while we may live in the most electronically connected age in human history, feelings of depression and isolation are prevalent, reminded Friedman. Educators must maintain the role of coach and mentor. Friedman also addressed the issue of global competitiveness and the crucial need to guard against relinquishing America’s standing in the world and in our educational system. As a common rule, brains are distributed equally, argued Friedman. The United States became the great country it is today because over generations we attracted more high-IQ risk takers who wanted to become part of the American Dream and the American experiment. When you do that for decades and hundreds of years, he explained, you build an incredible advantage over the rest of world. It is also true that once you start building walls and sending a message to those high-IQ risk takers that they should go elsewhere, you risk reverting to the global mean. Friedman cited China as having embarked on an ambitious goal of becoming dominant in the 10 most important industries of the future—including new materials, renewable energy, and robotics. From a competitive standpoint, as China begins to reshape its infrastructure and policies in pursuit of that goal, it will require a response in kind, argued Friedman. Slashing investment in our national laboratories to build a wall is not the right response, he added, because before you know it, our children and grandchildren will wake up to a world in which the United States has begun a downward glide to mediocrity. Friedman shared his prescription for maintaining competitive momentum—insights that he has also tried to pass along to his daughters as best practices for approaching life in general. Think like a new immigrant. These people are optimists who believe in the best possible outcomes, but always recognize that what they have can be taken away. Think like an artisan. Seek to be unique. Do your job every day with pride such that you want to carve your initials into what you create. Think like a starter-upper in Silicon Valley. Always be in beta and constantly retooling. Once you think you are finished, you probably are. Finally, said Friedman, remember that your PQ (passion quotient) plus your CQ (curiosity quotient) always beats your IQ. Keynote speaker Michele Norris addressed how race has shaped her life as a journalist, and encouraged business officers to get in front of the issues of race and diversity on campus—and be the champions and leaders of engaging, inclusive, and dynamic conversations across their institutions. During her session, Norris discussed the often-uncomfortable subject of race, and how we can better stimulate meaningful conversations about a topic that often ignites passion, controversy, and even animosity. As a new journalist, Norris had made it a point to not cover race-related topics. “I didn’t want to get put into the race box,” she says. But, her life, as she mentioned during her presentation, has taken many “left turns.” Instead of becoming an engineer she became a journalist; instead of shying away from the topic of race, she now confronts it head-on at national and international levels. The Race Card Project was birthed after she wrote her first book, The Grace of Silence (Pantheon, 2010), which uncovered issues of race in her own family. Through six-word responses, The Race Card Project explores the issues of race and identity. Six-word stories—for example, “My race is my constant companion”; “Race can mean nothing or everything”—can serve as a prologue or an epilogue to the conversation about this issue in America. Asking the room full of attendees the definition of “post-racial,” Norris received several different answers. She noted that in 2006 the word had become a buzzword for journalists; however, what we know today is that post-racial is not a realized concept, because “there is no finish line when it comes to talking about race,” said Norris. Over the course of several years, as the term grew in popularity and usage, Norris realized that although America wasn’t post-racial, it was having more conversations about race and what was happening in this country. This was a turning point—both for America and for how Norris began to address the topic of race relations. One of the things that Norris says she has learned through The Race Card Project is that “race is not a proxy for brown people’s issues—it’s not just about black people.” She stressed the importance of being much more expansive when we talk about race, because it’s not just a black-and-white issue. The uncomfortable truth is that white people need to get comfortable talking about race, and, moreover, understand that race relates to them as well. Don’t assume anything about any one person, and no one word can describe an individual. People very much want to talk about race and share their stories. We overestimate the ease of dealing with race when it comes to children and young adults. Although today we have more integration, there is still some level of discomfort there for young people. College students often feel guilty that they’ve let their family and community down, because they feel pressure to help usher in this “post-racial” society, and it’s simply not happening. As colleges and universities tackle ongoing protests and conversations around the topics related to politics, diversity, and equality, this discussion about race was timely. Institutional leaders are in positions to address these issues on their campus, but they must be active and diligent about creating spaces where students feel that they are welcomed, involved, and heard. Norris shared what she believes leaders charged with diversity efforts can do to enhance the dialogue in an environment where students feel accepted and respected. Include unidentifiable minorities. Students on campus often feel that diversity programs don’t include them because diversity only considers race. What about students without an identifiable minority status (i.e., religion)? Do a better job of making everyone feel that they are part of the conversation. Do the right thing. Fear is fleeting, but regret has a long shelf life. Don’t let fear get in the way of doing the right thing. Create an environment that reflects what is at your core. Diversity programs are great ways to get students involved, but do your diversity discussions really look like your core values? Culture is what happens when no one is looking. Extend grace—it goes a long way. Not everything is race related. Ask questions and engage in dialogue before you assume what someone means. Norris shared one final point with attendees: Figure out ways to engage in positive discourse; engaging someone you don’t agree with is a very important skill. 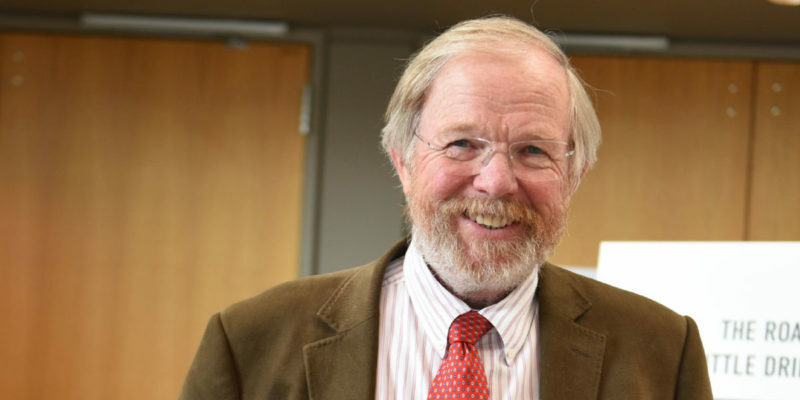 After several intense days of focusing on the many challenges ahead for colleges and universities, humorist and author Bill Bryson was at hand to lighten the mood. Take a moment to remember, from time to time, that you are alive. For endless eons, there was no you—and soon there will be no you. Don’t make the mistake of thinking that you are better than anyone else. Learn to appreciate the small pleasures. Life includes a lot of good stuff—a lot of special moments. CAROLE SCHWEITZER is editor in chief for Business Officer. See “Acceleration Check,” a May 2017 Business Officer interview with Friedman, in which he provides additional insights about the forces shaping our lives, workplaces, institutions, and communities in both dramatic and subtle ways. 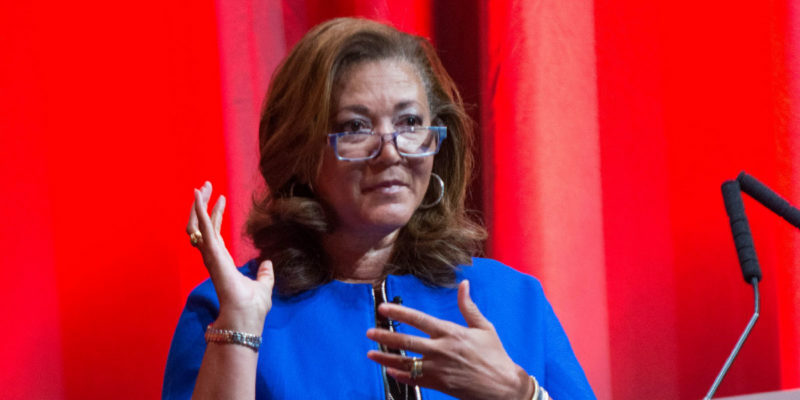 On Tuesday, Michele Norris moderated a more in-depth conversation about race and diversity on college campuses. The panelists, which included Martha S. Jones, The Society of Black Alumni presidential professor of history, Johns Hopkins University, Baltimore; Ruben Rivera, chief diversity officer, Bethel University, St. Paul, Minn.; and Ashish Vaidya, interim president, St. Cloud State University, Minn., examined the future of diversity initiatives in higher education and what postsecondary education will look like from enrollment to completion. The panelists shared their challenges and hopes for what isn’t always an easy conversation in higher education. At St. Cloud State University—a state college in Minnesota—Vaidya noted that the campus is working on closing the attainment gap, which has not changed in the last two decades. Many things will need to happen in order to close that gap. “Engage students of color in high-impact practices, like study abroad, service learning, and community-based research, which is highly valuable,” Vaidya noted, Institutions must be intentional about creating these opportunities. Bethel University, a Christian college, is trying to build institutional capacity that will allow diversity to increase and flourish. “Build a reason why people want to come and when they arrive they can thrive,” said Rivera. Once colleges recognize the challenges, they must implement best practices to attain and maintain a fully diverse student, faculty, and staff community. Pointing out that corporations promote diversity and inclusivity through their commercials (showing an increasing number of mixed-race and gay couples), Norris explored with the panelists what needs to be done in higher education so that conversations about race and diversity are advancing at the same rate as corporate efforts. While the inclusion conversation is siloed, it is becoming more important for everyone to have a seat at the table. Speakers shared what institutions can do to further promote efforts that will give a voice to not only leadership, but faculty, staff, students, and even alumni. Structure. The topic of diversity should be all encompassing. “Create a space that includes diversity, but doesn’t begin with diversity. This will bring many more people to the table,” Jones said. Outcomes. Vaidya shared that “we need to get past the semantics about the words diversity, inclusion, and engagement.” Further, “although it is a smart investment, it becomes risky if students don’t leave the institution with valuable skills and a degree.” He encouraged attendees to focus on the intended outcomes for students, the campus, and the community; once you agree on the vision, you can work toward that goal.